Good morning from Augusta. A largely unheralded 2016 legislative move made Maine a presidential primary state, but a quirk took the law off the books. Good morning from Augusta. A largely unheralded 2016 legislative move made Maine a presidential primary state, but a quirk took the law off the books. If Mainers want a chance to vote in a presidential primary next year, the Legislature is going to have to find money for a new election. The switch from party-run caucuses to state-run primaries gained momentum shortly after the two major parties had issues during the presidential caucuses three years ago. Democrats had long lines and Republicans held regional caucuses that were hard for many to get to. Primaries would increase participation and there has been wide bipartisan support for the idea, but it will have to be funded by the Legislature to be in place by 2020. That’s probably the main obstacle right now for lawmakers looking to do it. 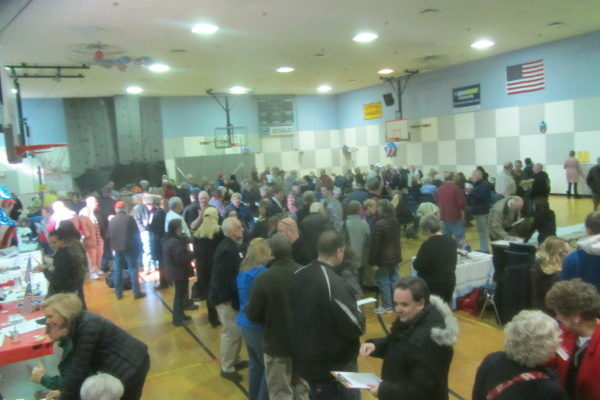 The last caucuses were marked by heavy turnout by caucus standards. Primaries would sharply raise participation, but at a cost. Democrats and Republicans hailed their turnout in the March 2016 caucuses, where Maine backed the eventual runners-up for both nominations: Vermont Sen. Bernie Sanders and Texas Sen. Ted Cruz, respectively. But only 15 percent of Democrats and 7 percent of Republicans caucused in 2016. While the Democratic figure is high for a typical caucus, Maine turned out 2.5 times more voters during the last primary for an open presidential seat in 2000. After the 1996 and 2000 primaries, there was a desire in the Legislature to return to the caucus system to let parties decide how they wanted to nominate candidates. Lawmakers and Gov. John Baldacci, a Democrat, repealed the short-lived primaries in 2003. The logistical issues of 2016 brought Maine full-circle. A last-minute bill to return to primaries flew through the Legislature and was signed by Gov. Paul LePage, a Republican. It wasn’t definitive, directing Secretary of State Matt Dunlap to study the costs of a primary and setting the primaries for repeal in December 2018 if the Legislature didn’t say otherwise. It didn’t say otherwise. That’s why Maine is officially still part of the minority group of caucus states. Dunlap came back with a 2017 report estimating the cost of a primary at $979,000, with $857,000 of that born by cities and towns. A top Democratic lawmaker is hopeful that primaries can begin next year, but cost will be the main obstacle. Sen. Louis Luchini, D-Ellsworth, the co-chair of the Legislature’s election committee, is sponsoring a bill this year to reinstate the primary language. If it passes, the primary would remain in March and parties would have to craft conforming rules on how to allocate electors. Luchini said he’s optimistic about the bill’s chances this year, citing bipartisan support and saying the two-year budget will allow flexibility to fund the primary. Spokespeople for Senate President Troy Jackson, D-Allagash, and House Speaker Sara Gideon, D-Freeport, support the primary. But a Gideon spokeswoman said she would monitor the bill to ensure it has no “adverse fiscal or participatory impact.” Spokespeople for Gov. Janet Mills, a Democrat, didn’t respond to a request for comment. Luchini expected cost to be the main sticking point. Rep. Scott Strom, R-Pittsfield, a lead Republican on the election committee, said while he likes the idea of a primary, he’d back the caucuses if the new primary can’t be run concurrently with Maine’s regular June primaries because of cost. But if the presidential caucuses were then, Maine would have little influence in the process, so a new election is probably where Maine would have to go. Action picks up today, with Cabinet nominees at center stage. The Senate and House of Representatives return to chamber this morning, and four of Mills’ Cabinet picks will be vetted in legislative committee confirmation hearings this afternoon. — At 1 p.m., Heather Johnson, Mills’ choice to lead the Department of Economic and Community Development, will appear before the Committee on Innovation, Development, Economic Advancement and Business. The Committee on Marine Resources will interview Patrick Keliher, renominated for commissioner of the Department of Marine Resources, and the Committee on Transportation will interview Bruce Van Note, nominated to serve as Department of Transportation commissioner. — At 2:30 p.m., Kirsten Figueroa, chosen by Mills to lead the Department of Administrative and Financial Affairs, will appear before the Appropriations and Financial Affairs Committee. — Five other legislative committees meet today, two of which include public hearings on proposed bills. — There’s a new push to use government resources to take control of Maine’s electricity providers and create a consumer-owned utility. Maine Public reports that a consortium led by Rep. Seth Berry, D-Bowdoinham, House chair of the Legislature’s energy committee, unveiled a plan Monday to create a new authority to buy electricity system poles and wires owned by Central Maine Power and Emera Maine. Berry suggested that state revenue bonds could be used to fund the more than $4 billion purchase in hopes of lowering rates and improving service. Similar efforts have failed in the past, and electric company officials questioned the legality of the plan and whether the success of smaller customer-owned utilities could be duplicated on a statewide basis. — Meanwhile, the Canadian public utility that stands to make big money from a proposed transmission line through western Maine is keeping a low profile in debate over the project. Hydro-Quebec has engaged in a public relations campaign to win support for the $1 billion transmission line that would deliver power generated by its dams through western Maine to consumers in Massachusetts. But Hydro-Quebec has largely avoided the regulatory process underway at the Maine Public Utilities Commission, letting attorneys for partner CMP make the case for the project. That hands-off approach has frustrated environmental advocates and some folks whose property would be affected by construction of the transmission line. — Mental illness, substance abuse and domestic violence are the most common factors cited in a study of recent cases in which Maine police officers fatally shot people. A state task force that Mills created when she was attorney general reviewed the use of deadly force by Maine police officers following an uptick in fatal police shootings in 2017. The panel released a set of recommendations for decreasing or preventing the types of incidents that led to those encounters. In the report released Monday by Mills’ successor, Attorney General Aaron Frey, the task force urged state officials to adopt stricter penalties for people with a history of domestic violence who violate their protection orders and conditions of release. — A manager to handle the nuts and bolts of Medicaid expansion in Maine has been hired. Acting Health and Human Services Commissioner Jeanne Lambrew announced Monday that Michelle Probert, most recently a health services manager at Bath Iron Works, will be the new director of MaineCare. Probert takes the position as Mills’ administration is ramping up efforts to enroll recipients under a Medicaid eligibility expansion approved by Maine voters in 2017. Prior to taking a job at the shipyard, Probert, 41, served for three years as director of the Department of Strategic Initiatives for MaineCare early in the LePage administration. If you are already sad or even a little melancholy, stop reading now. This is only going to ruin your day or elevate your fretting about Maine’s frostbitten celebrity hawk. Trevor, a blown-off-course duck whose lonely life in a puddle on a Pacific Island made him a global celebrity, has died. The Guardian reports that Trevor’s remains were found in a bush after dogs allegedly attacked the forlorn fowl on the remote South Pacific island of Niue. His immortal soul joins that of Nigel, the loneliest gannet, to flutter across the avian elysian fields populated by formerly lonely birds. News of Trevor’s death threw the southern hemisphere into mourning. Trevor Mallard, New Zealand’s parliamentary speaker for whom the duck was named, sent a message of condolence to the people of Niue. Rae Findlay, Niue’s chamber of commerce chief, called the duck’s demise a loss for the nation. “He captured many hearts and even the rooster, the chicken and the weka were looking a little forlorn today wandering around near the dry puddle,” Findlay told Australian broadcasters. Niue, a remote atoll that’s a three-hour flight from Auckland, has 1,600 human inhabitants. Because of a quirk of wind, it had one duck, which was so beloved that New Zealand’s former high commissioner would regularly feed him and firefighters would freshen his puddle with clean water. Would that we humans would be so nice to each other. Hang in there, Hector the hawk. Keep an eye out for bad dogs.